First, introduce the world to Sadogoat with a history and some general information. Sadogoat was formed in the year 1998 A.S. first it was only me, but at that moment I couldn't play the drums very well so my old friend Lord Titan joined in, and that led to our first demo being recorded in 1998 with Lord Titan doing the drums, session member Heinrich H. from Koldborn doing some leads and me doing the guitar, bass and vocals-along with the recording and mixing. The songs we recorded were all created by me during the end of 1998 - beginning of 1999 except "There Is No Silence In the Abyss" which I created in 1995 in a former band I played in called Mørket. Then for a while nothing happened because I got tired of playing music after we had recorded, but then in the end of 1999 I met Katal, who asked if he could join us because he was tired of his old band Kvæl, and as a trio we started rehearsing again and creating new songs, and at the moment we are rehearsing for our next demo. Your demo "Et in Arcadia Ego" is very raw and grim sounding. I don't think many people can appreciate this sound, also, some of the song titles might have a hard time being taken seriously. 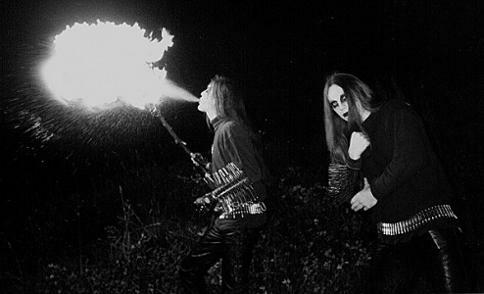 Such as "Female Goat Perversion", "The Sabbath of the Goat", "Blasting Black Goat Attack", and finally "Outro: Raped By the Horny Goat". I see a definite similarity here regarding your sound titles (and even the name of the band), to say the least. So tell us what this is all about, and your intentions. What are you attempting to project with SadoGoat? This is really no big deal, first of all I named the band Sadogoat, and for the sound I have always loved crunchy and distorted sound so it just felt natural. For the titles of the songs, when I created the songs I just thought it could be great if their titles included goat, actually I wanted all of the songs to have goat in their titles but then again I thought (also influenced by Titan) that it would be a little bit too lame. 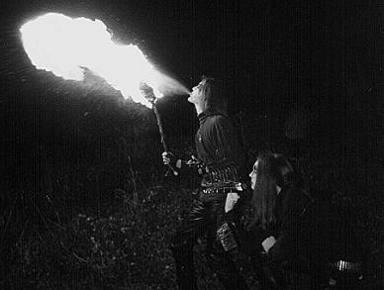 The fact that a lot of Black Metal people have found it provoking has just amused me, that wasn't the intention, but very funny it is! Despite the criticism, I think the music speaks well enough for itself. I'm not entirely sure what it is, but there is a certain element in your music, which is great in its primitive sound/feel. And I think this shines the brightest in the first track (excluding the intro), Female Goat Perversion. I guess you probably felt similar, which is maybe why it is the first song on the demo. I didn't put the songs onto the tape in any particular order, it was just in the order that we played them when we rehearsed, but I do feel that "Female Goat Perversion" is the best song on the demo, and it was also the first song I created for Sadogoat, the primitiveness is just the ultimate way for me to create the songs, it's like when I listen to technical music I most often get tired of it very easy, and I don't want to create anything like that. The music/lyrics are also semi-reminiscent of old Beherit, they are an inspiration to you, are they not? Yes, you got it, Beherit is definitely a huge influence to me, especially when I created most of the songs from our demo, at the moment I only listened to Beherit, Havohej and stuff like that... Beherit are simply the gods of Black Noise, even though they didn't continue in the vein of noise, I don't know, I just find everything about Beherit brilliant, especially the early recordings. The second demo "Malleus Maleficarum" has been delayed. Tell us about this new recording, and the reasons for it being delayed. The main reason why our next demo is so delayed is because we are now a trio, and have to rehearse like a trio, it was much easier when I was the only creative person in the band and Titan just hammered the drums, but now Katal is also creating some of the songs and it's just not that easy anymore... we have to learn each others songs, and we use more time to make changes, instead of the way we had as a duo, I came with a song and I told Titan what to play and that was that, then we would have a song. The name Malleus Maleficarum brings up a good point. The book written in the middle ages by two Dominican friars and was instituted for the purpose of dealing with suspected witches. It became a bible of the hysterical, superstitious witch hunters, judges and magistrates in their quest to destroy the old pagan religions. It became a tool of greed, murder and vengeance for them. I have in possession two copies, one written in the mid-sixties, and the other in the nineties. It's a good point that the new version has been cut in half with 'editing'. The new version seems to be lacking all of the grim barbarities of the original version. All of the embarrassing rambling, procedures and descriptions are now gone. It's easy to see why they wish to hide this now. Your thoughts on all of this? The things they did to people back then, it was so sick, I can't believe how they could create such sickening thoughts, but it's cool that the Christians once were such bastards totally contrary to what they stand for now and then. About the way the book has been censored now that's somehow just as sick, I don't believe in censorship, I think it's wrong to censor anything no matter how sick it is. Tell us about the your local scene in Denmark, is BM wide spread there? Do you receive a lot of support locally? Ever play live? The scene in Denmark is not that big yet, but there is definitely something going on, one of the bands you might know is Denial of God, they have been around for some time now, but there is also a lot of new bands around, some of them really good and a lot of them really bad, and here in Denmark I believe most people think we are among the really bad, but then again I don't care, I just play what I feel for, I don't want to compromise. At the moment we haven't played live, both because we haven't had enough material before now, but also because Katal was included in the line-up and then we had to learn how to play like a band. Do you have future plans to get signed to a label? Any that you feel would fit your style and music? I haven't got any plans to get signed, and I really don't think any label would want to sign us, but it could be cool, I really don't care which label signs us as long as they're not Christian and do not try to interfere with the process of making music, sound and cover etc. I don't want to compromise not even if I get paid for it, there would be no reason playing if it wasn't because of the feeling. The song Female Goat Perversion... in the middle of the track there is speech that sounds like it was taken from somewhere, and it ends in a wicked sounding scream, what is this taken from? That's taken from "The Exorcist" and the scream too, actually I found out after releasing the demo that Mysticum (I think) is using exactly the same piece of the film, but then it was too late. What has the response been to your demo? It is limited to 50 copies, of which I have #31. I have heard from a lot of people who liked it, but just as many that didn't like it, but then again I really don't care... well of course it is nice when people like it but I did it for myself and not for anyone else! These days cassette demos are a lot rarer than they used to be. With CD-R technology, and the recent popularity in DM/BM, bands often get a record deal before even putting out a demo. Personally, I don't like a lot about this... what are your thoughts? I hate the idea of putting out demos on CD-R, actually it would have been only a couple of bucks more expensive to have our demo released on CD-R, but I wanted to have it released on cassette, their is a totally different feeling about a cassette then a CD-R, and people expect a CD-R to have a nice cover and a nice sound and I didn't want any of that. I wanted an ugly cover copied on normal paper and I wanted a crunchy sound which was so ugly that it would be a shame to put it onto a CD, and I think we managed... hee hee hee, no CD-R for me! Tell us your thoughts on religion. Christianity/Satanism more specifically. I think it's all crap, I find it very interesting, but it's all crap. What do you believe awaits you after your life is over. I believe we will rot and become good fertilizer! Your thoughts on the modern world and its future? Well hopefully the world will become a little bit more depopulated fast! But I don't really see anything happening. What are some of the good and bad things about living in Denmark. Have you visited other regions? You can get a free education, that's good, but there is too many lame people, and that is bad, but I believe the last thing goes for the rest of the world as well. I really haven't been that much away from Denmark, maybe I will someday, but I don't know. What sort of things inspire you outside of music... what emotion would you say is most prevalent in your life? I get inspired by nearly everything in my life, books, films, food etc. I don't get very inspired by emotions, at least not my own, I'm mainly depressed a lot, but I don't find that very inspiring, more the contrary, when I'm depressed I usually can't create anything, not music, not lyrics, not anything! How can those interested in Sadogoat obtain your work? At the moment they can't, but there's samples on our homepage, and hopefully there will soon be released a new demo. Maybe sometimes in the future "Et in Arcadia Ego" will be re-released but I don't know.